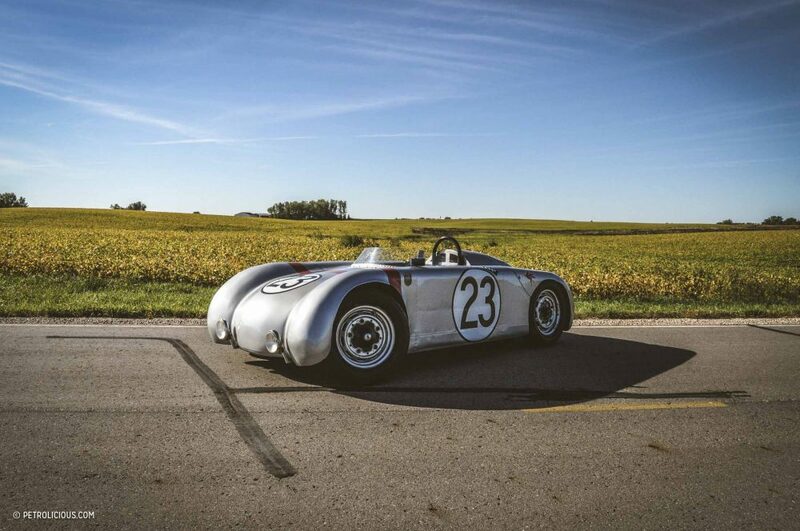 Featured: The Early Years Of Porsche Are Alive And Well In…Minnesota? 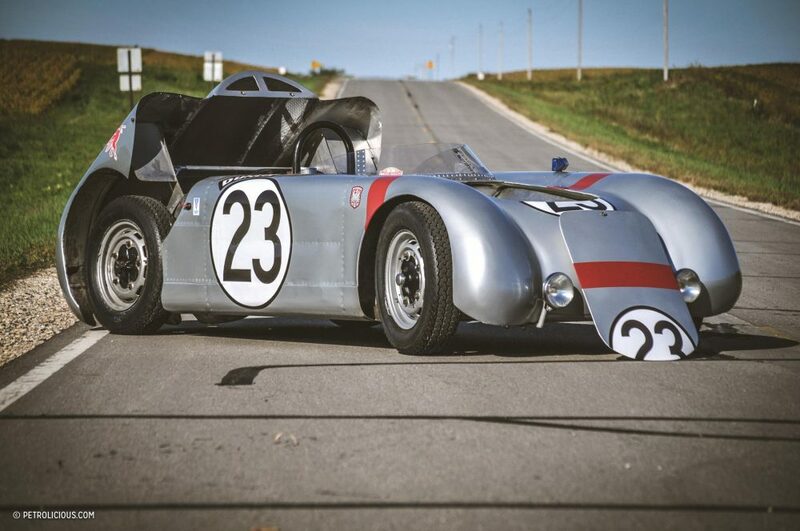 The Early Years Of Porsche Are Alive And Well In…Minnesota? Hidden away in a small, quiet corner of Minnesota, something exciting is happening. Among a series of dirt roads and lakes, surrounded by forest, sits a small workshop owned by Christopher Runge. It’s the type of setting that urges you to turn off your phone, take a deep breath, and slow your mind down so that you can take it all in, free of distractions. Before you, a room filled with treasures. 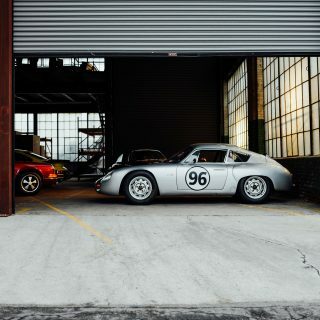 The walls are lined with vintage engines, there are panel-shaping tools, and garage art begging to start a conversation. Looking over to a dark corner you see a wooden buck, sheets of aluminum, and more parts waiting for their turn. At a young age, Runge knew he loved cars. He drew pictures of them as a young boy much like he does now. He scoured junkyards with his dad, “That’s what we did for fun,” he says. A love for mechanical things was obviously in his blood, a disease that afflicts a lot of us, but it’s possible his case is a little more severe than others. Home schooled from 5th grade through high school, Runge found his own path early on. He began snowboarding professionally at age 16. He retired in 2006 after a ten-year career, and launched a business specializing in aboveground and underground fuel take preparation for biofuels in the southeastern U.S. What happened next was pretty prophetic: Runge was unhappy with the equipment he had purchased to clean the tanks, so he dismantled and scrapped many of the components and then designed and fabricated his own system. His system ended up a success, and he ultimately sold his company 2013. Cars have always been around Runge. Porsches, Volkswagens, Volvos, whatever he was interested in. Most were given the same treatment of disassembly, restoration, and improvement before being sold to fund something else. 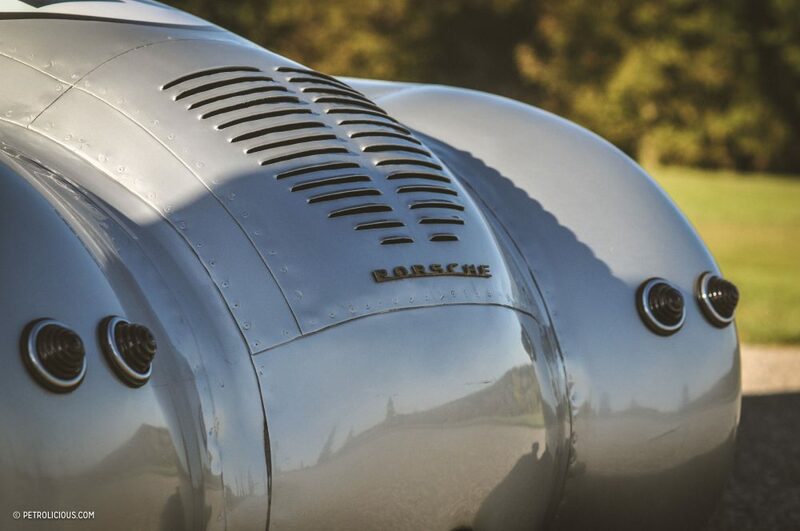 At one point however, Runge realized that the one car he really wanted was a Porsche 550. 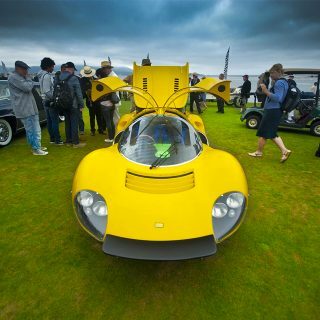 He’s a resourceful guy, and he even managed to track down a few examples for sale, but was also smart enough to realize that even if he managed to buy such a rare car, he would never feel comfortable driving it to its capabilities, considering the large investment involved. 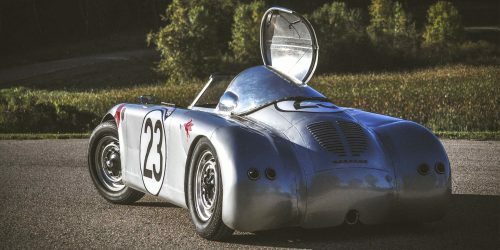 Captivated by post World War II German Eigenbau (homebuilt) racers, Runge became fascinated with the idea of building a car using fabrication methods of the era. 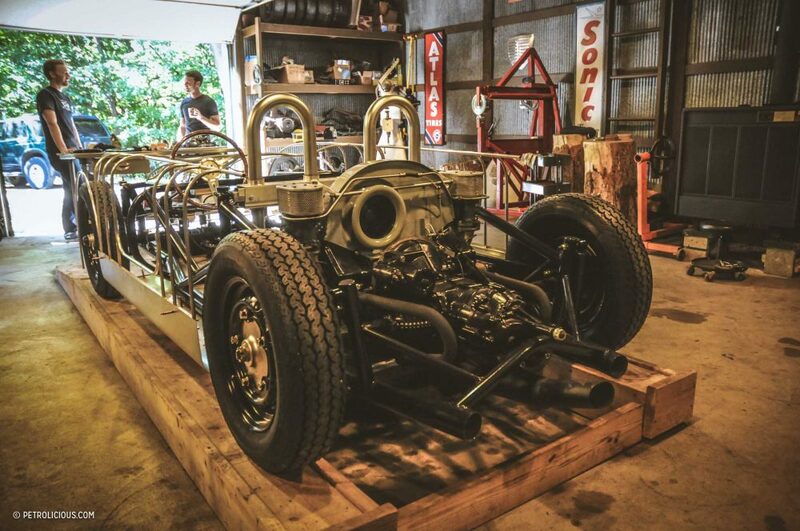 The idea wasn’t to replicate a specific car, but rather, to capture an era through building his dream car. 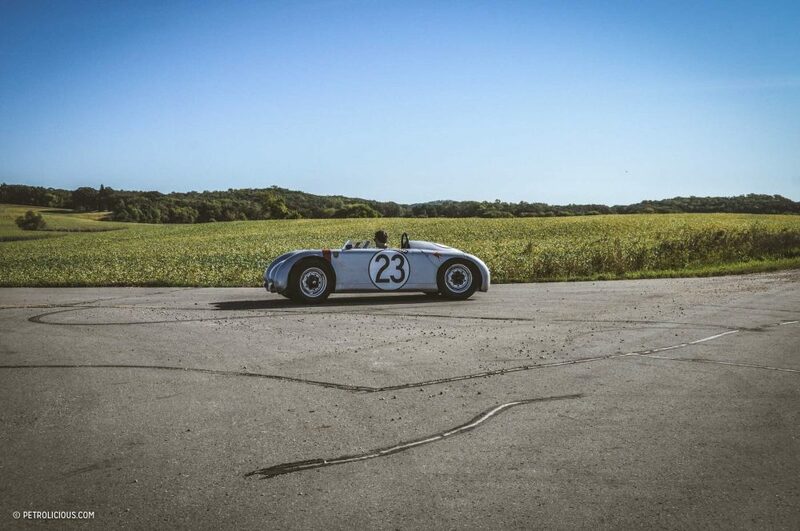 The dream of hammering his own aluminum-bodied car became much more realistic in the summer of 2011 when he stumbled across a barn find most car guys dream of. 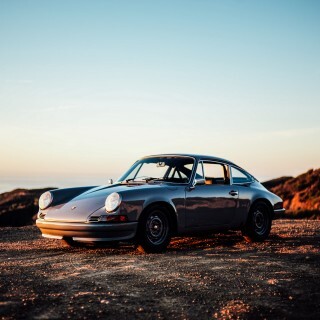 The deal was originally for a 1967 Porsche 912, however, after arriving to pick up the car, Runge was allowed to look through the seller’s barns to see if there was anything else he would be interested in. Nobody buying a rusty 912 would ever turn down such an offer, so of course he had a look. Runge came away with shaping hammers, welders, and among other things, an English wheel. Either he found the tools or the tools found him, but together at last, it was time to begin. The Frankfurt Flyer, as it’s now known, started life on paper as rough sketches. 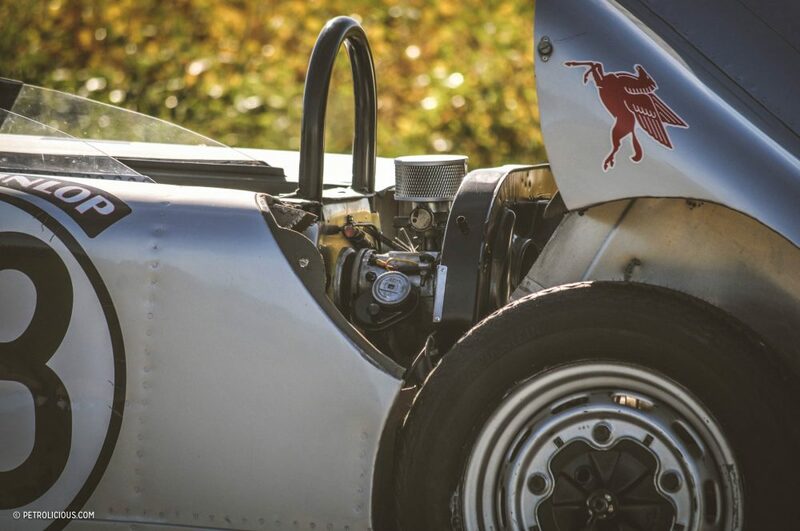 The shapes and ideas were painstakingly translated into a wooden buck tailored to fit Runge and built directly onto the chassis, one panel at a time. His methods of shaping using hammers and lead-shot bags, tree stumps, and an English wheel, are all a very traditional and old-world process. Sometimes they turn out, sometimes you start over, but this is a style that can’t be rushed, making Runge’s workshop setting absolutely perfect. Step outside, stare at the lake, take that deep breath again, and head back in for some more. On the finished car, there’s just a right amount of imperfection to let you know it’s done by hand, but done well. That said, there are no amenities, no creature comforts, and sliding inside the center cockpit requires a shoe horn if you’re taller than six feet. 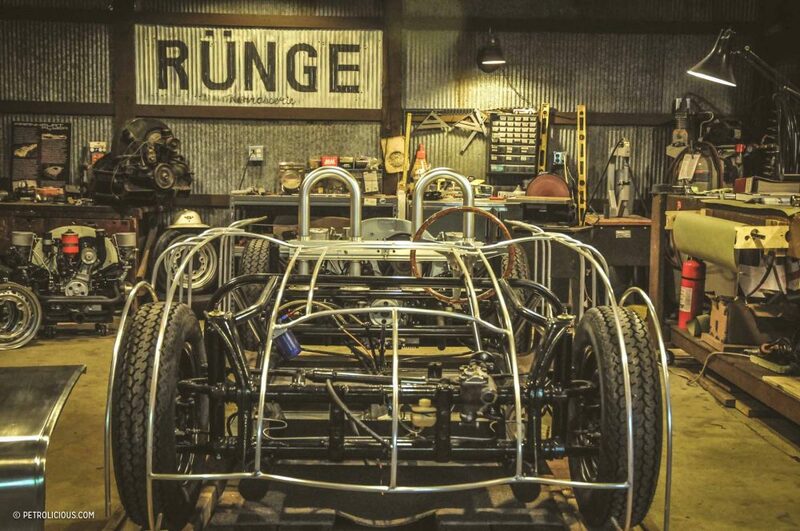 It’s tight for a reason: Runge started by modifying an old Forumla Vee chassis. He fits like a glove and that’s the whole idea, that the car fit the driver. It has a true race car feel from the moment you settle in and put the removable steering wheel back in its place. There’s no spare room for your feet, or your legs for that matter, but it all gives the feeling that you’re about to drive something purpose-built. The customized short-throw shift lever has the right amount of mechanical feel, requiring just a little extra muscle until you learn the finesse required. 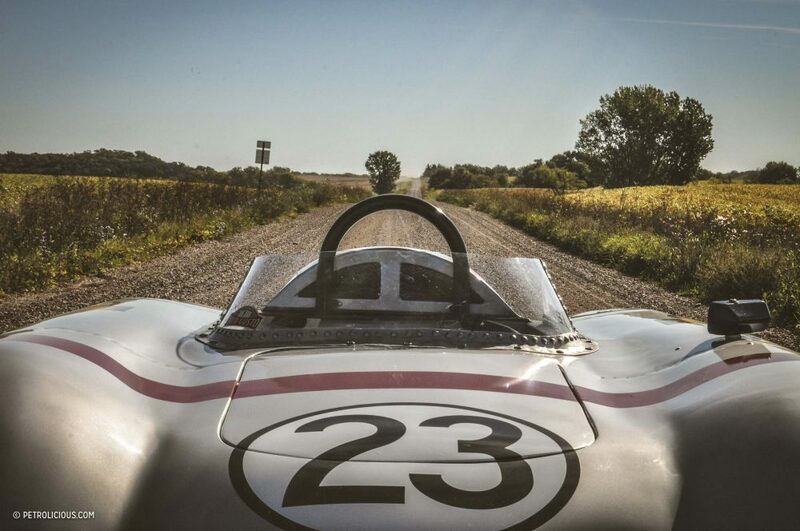 Corners are handled with little to no roll despite narrow tires, and from the center seat, the view of the road is perfectly mixed with rolling fenders. 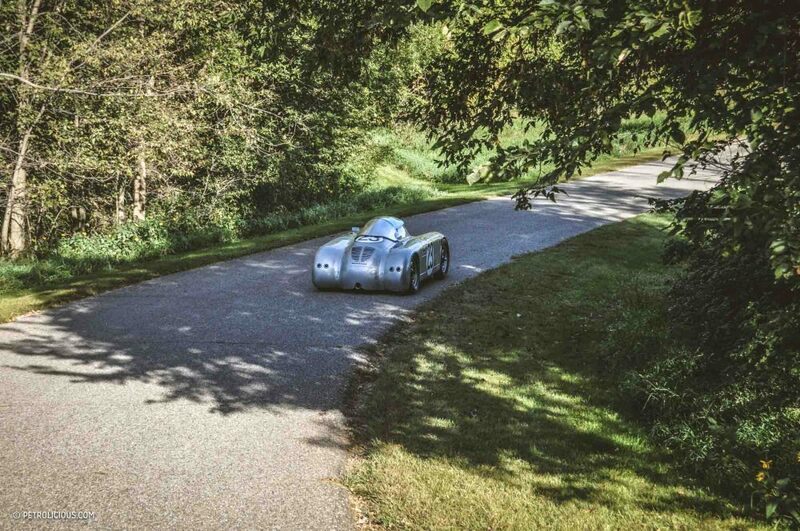 With the right vintage helmet, it would be easy to channel Sir Stirling Moss or Phil Hill. 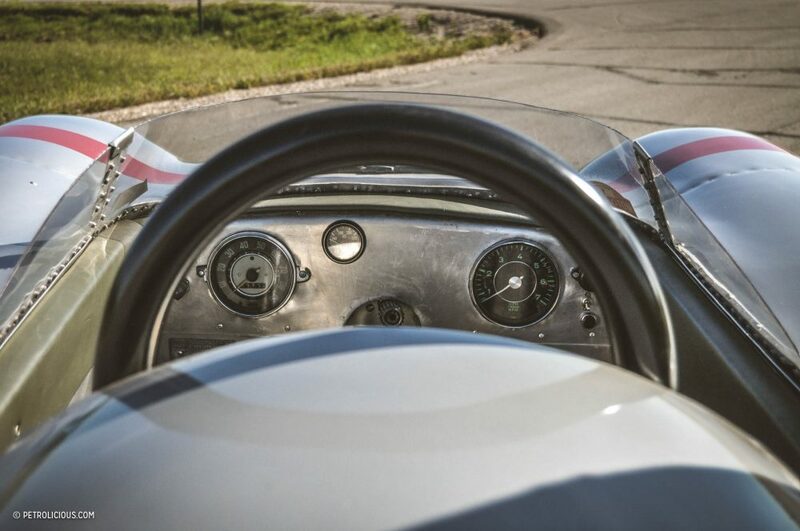 At speed, the view ahead almost turns black and white as you feel the same sensations as those early racing drivers, a priceless experience if there ever was one. After completing what Runge calls his “Prototyp,” he was approached to make more. Capable as he may be however, he also decided to get a little help and consulted one of the best names you’ve never heard of to help with his engines: Tom Bruch of Cedar Rapids, Iowa. Bruch has been building engines for a long time, and in the same manner as Runge, he’s done things in his own quiet, resourceful way. 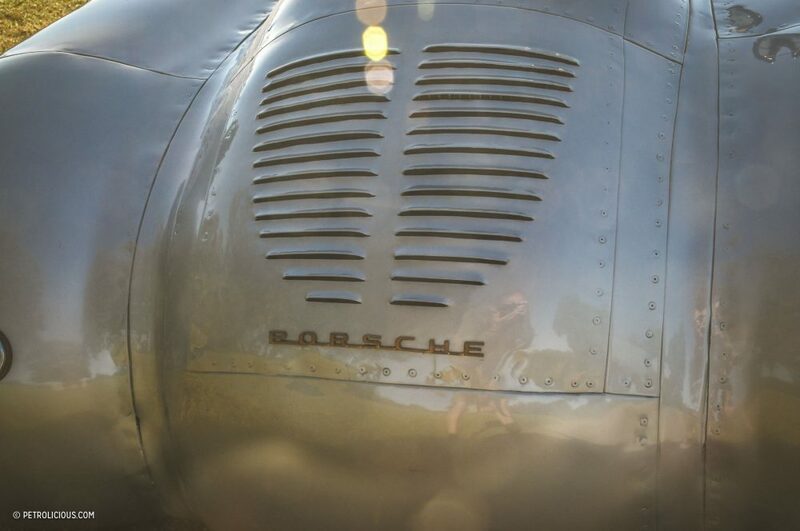 He set his first land speed record at Bonneville in 1967 in a Porsche 356 Carrera Speedster. 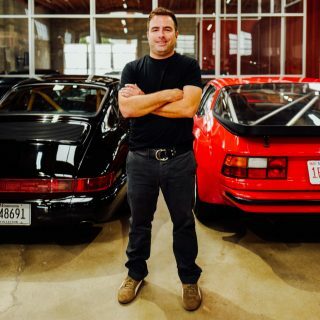 He went on to set multiple records since, and he’s become so well known for his style of engine tuning that they are now referred to as “Bruchrasa” engines, coined after the vintage Volkswagen tuner Okrasa. Bruch uses similar methods of finding horsepower through cylinder heads and airflow, not unlike the bolt-on kits formerly offered by the now-defunct aftermarket supplier. All of that Porsche and VW tuning knowledge is being bolted mid-ship into each Runge build, and it’s a perfect combination. “It’s so satisfying to fabricate something of your own design,” says Runge. 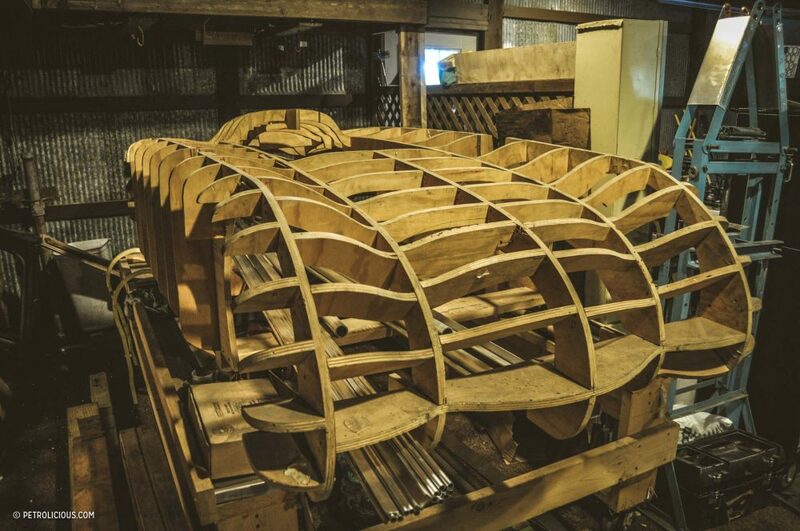 Which brings us back to the two seater centered in his workshop. After completing the Frankfurt Flyer and two other examples, Runge’s latest creation is a two-seater with more road-worthy refinement. He can now build a car with a driver’s fit and comfort more in mind. Seats and pedals can be adjusted, and even the wheelbase can be tweaked to give a driver exactly what they’re looking for. He’s also developing chassis plans for alternate power plants such as Italian, British, Porsche flat-six, and more. Runge will meet with a customer to develop exactly what they want for details and paint themes, further developing into what he hopes will be a brand that people will one day recognize. And with cars like the Flyer, who needs Bluetooth, anyway? Visit flyermotorwerks.com to learn more. Travel Is This What Rally Car Heaven Looks Like? Truly inspiring – great story and profile! Exactly what this website is all about. Great car and well done to all those involved! Fantastic! That would be such a raw driving experience. 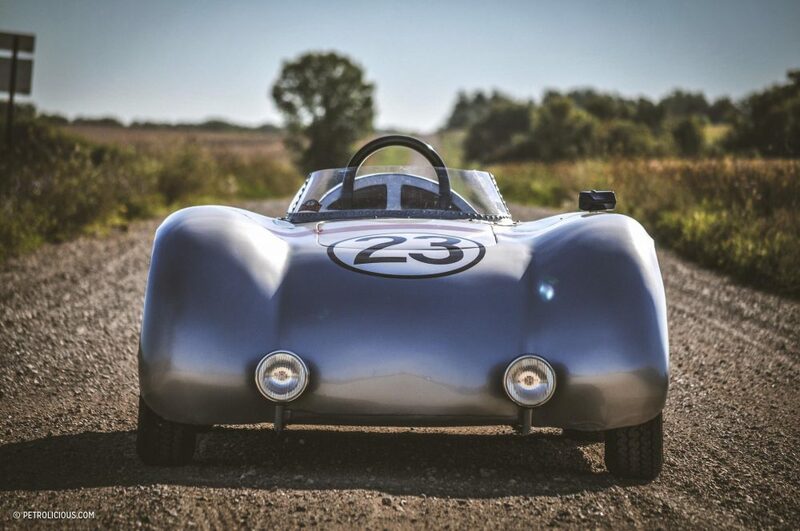 I’ve got a mid-engined 550 replica but this one off is a true Special. Those tyres by the way looks like Vredestein Sprints to me by I’m not sure. 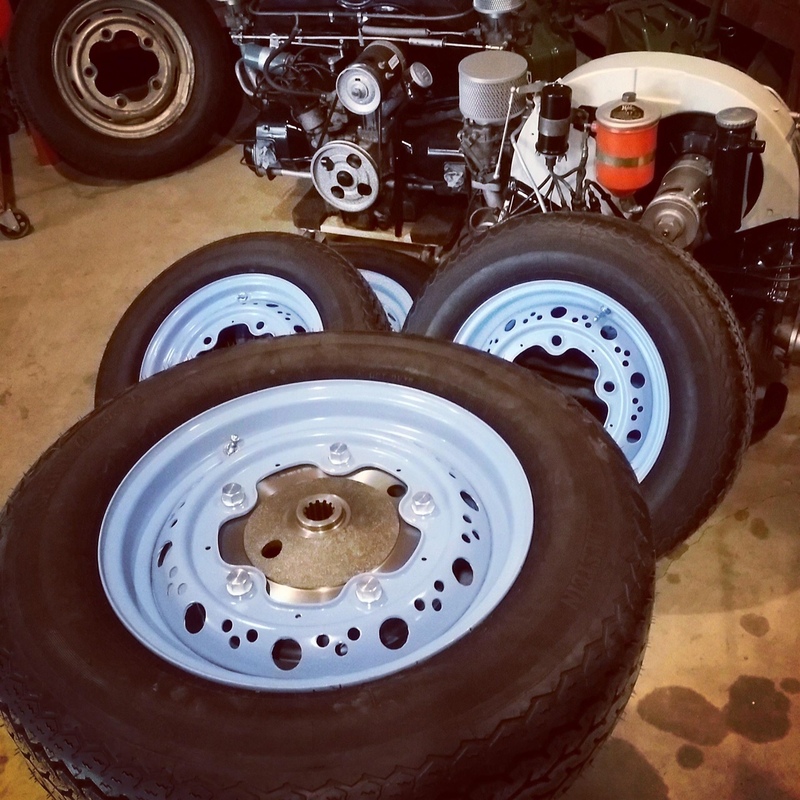 Does anybody here know what tires those are? Pretty sure they’re Vredestein 165R H Rated Tires (since those are the tires he’s using for the Frankfurt Flyer he’s building for me). This is my speed. Fun stuff. I really appreciate the vision and the endeavor to realize it. I design and build stuff too, and many do not truly understand the time and energy that go into creating something like this. Side note: Before I was born, my father had a 1953 Pre-A with an Okrasa. I think he yanked the motor and sold it for 50 bucks or something… may have even given it away….times were different then. A video would be wonderful. Thanks for sharing. Website for Mr Runge and his cars por favor ?